The Black Swamp Conservancy (BSC) owns and manages the 346-acre Forrest Woods Nature Preserve, which BSC has acquired over the years. This nature preserve is one of the finest remnants of the historic Great Black Swamp and is home to more than 30 rare, threatened and endangered plant and animal species . In 2016, BSC initiated the restoration of approximately 60 acres of land adjacent to the nature preserve with funding from 3 grants: Great Lake Restoration Initiative, Surface Water Improvement Fund and a Sustain Our Great Lakes grant, totaling approximately $800,000. The project would include the restoration of over 3,500 feet of stream, approximately 40 acres of wetlands and expansive reforestation and revegetation work . The restored wetlands included a combination of riparian wetlands,vernal pools,emergent and forested habitats. The Forrest Woods Nature Preserve is strategically located for wetland restoration due to its proximity to the confluence of the Marie Delarme Creek and the Maumee River. Restoring wetland functionality on the preserve will increase its capacity to hold floodwaters and filter out nutrient and sediment pollutants before the water reaches the Maumee River. As part of the project, Kent State University is conducting pre- and post-construction monitoring and modeling in order to determine the nutrient attenuation benefits of the stream and wetland restoration and to try to inform future restoration designs so as to maximize nutrient removal. Bill coauthored Federal and State Grants to establish an 85 acre Nature Preserve on and adjacent to the School Campus. He worked with ODOT and Dr. Mitsch of the OSU Wetland Research Program to mitigate (replace) wetlands destroyed by nearby highway development, resulting in the establishment of a 30 acre Wetland Conservation Area on the school campus. He collaborated with the Eastland Career & Technology Center to establish a Satellite High School Environmental Science Program at the New Albany Nature Preserve that serves students from 16 School Districts. The program is ranked among the top three in the United States and #1 in the State of Ohio. Bill also collaborated with The Ohio State University College of Engineering, Knowlton School of Architecture to transfer ownership of the 2009 International Award Winning OSU Solar Decathlon Building to the New Albany - Plain Local Schools. In total, Western Reserve Land Conservancy has permanently preserved 690+ properties totaling more than 51,000 acres in northern and eastern Ohio. Approximately half of this acreage conserves vibrant natural areas – including thousands of acres of wetlands. A couple of WRLC’s recent preservation projects include Sugar Island Preserve and Mill Creek Wetlands. Sugar Island Preserve (Ashtabula and Trumbull Counties) is one of WRLC’s more recent high-profile projects involving the permanent conservation and restoration of acres of wetlands in Ashtabula and Trumbull counties. Not only does the project permanently preserve an impressive 1,500 acres, it also will restore over 200 acres of wetlands and redirects nearly 3 miles of Snyder Ditch into a flowing wetland complex with expansive floodplain connectivity. Mill Creek Wetlands (Cuyahoga County) represents the importance of wetland conservation in an urban setting. Though the property is just 10 acres, it is surrounded by development – preserving the property ensures that this wetland area will continue to filter and hold storm water and provide critical habitat for local species. ​Leader In Wetland Advocacy – The Ohio Environmental Council (OEC) is the most influential and effective environmental advocacy group in the state. OEC is active on a large numbers of issues that affect all aspects of the environment across the state. One of the outstanding efforts of the OEC is their continued fight to protect wetlands in a state that has lost 90% of its original wetlands. In their own words “The Ohio Environmental Council fights to protect our few remaining wetlands by lobbying the Ohio legislature, working with regulatory agencies, educating citizen scientists, monitoring vernal pools, and taking legal action.” We applaud their work and believe they are meeting their mission. Nathan Johnson, an attorney with OEC’s William W. Ellis Environmental Law Center, accepted the award. 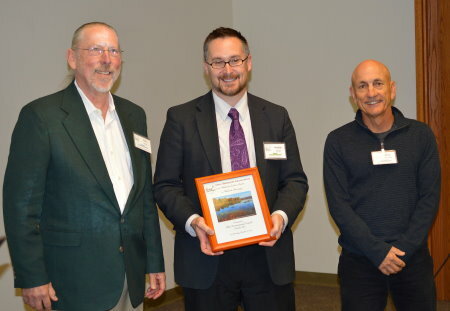 OWA takes great pride in awarding the 2015 Leader in Wetland Advocacy award to the OEC and looks forward to partnering with them in the future on the important issues impacting Ohio’s valuable wetland resources. Leader In Wetland Protection – The Winous Point Marsh Conservancy (WPMC) of Port Clinton has been instrumental in the protection, restoration, enhancement, and wise management of coastal wetlands and watersheds in southwest Lake Erie. Through a combination of private contributions and leveraged grant funds, WPMC is working to aid and facilitate wetland conservation programs and research in cooperation with neighbors, state and federal agencies, and other non-profit conservation groups. Coastal wetlands of any type are a rarity in the Ohio. 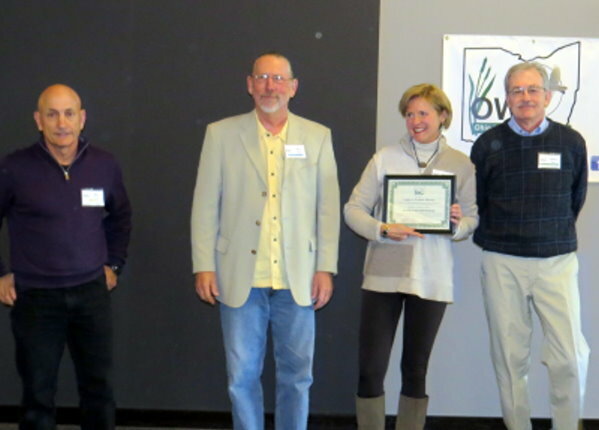 Wetlands of the level of quality represented by those owned and managed by the WPMC are truly gems and OWA is delighted to bring attention to the outstanding job the organization has accomplished in wetland protection. WPMC has worked closely with The Ohio State University (OSU) and other state colleges in graduate research conducted on the WPMC wetlands to better understand and protect their functions and floral and faunal resources. Dr. Robert Gates, Associate Professor in the OSU, School of Environment and Natural Resources, accepted the award. Leader In Wetland Restoration – The North Coast Regional Council of Park Districts (NCRCPD) is a consortium of the Erie, Lorain, Medina, and Sandusky County Metro Parks who joined forces to undertake wetland mitigation banking projects on their properties in northern Ohio. Through the process the NCRCPD has been able to acquire new parcels with significant acreages of newly restored wetlands and protective buffers to add to their parklands. The most impressive part of the program has been the consistently high quality of the wetlands that have been restored. 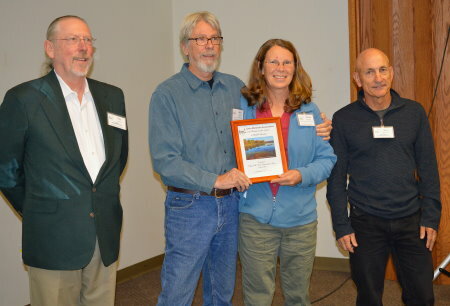 OWA is pleased to recognize the NCRCPC for their outstanding restoration projects at parks throughout their systems. 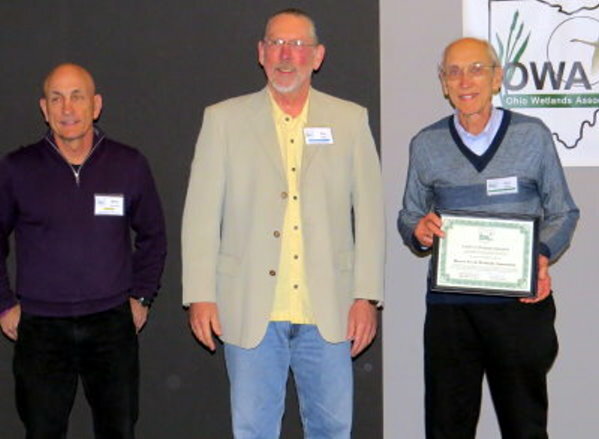 They are lighting the way for others involved in restoring wetlands as compensatory mitigation and we salute the high caliber of their accomplishments. 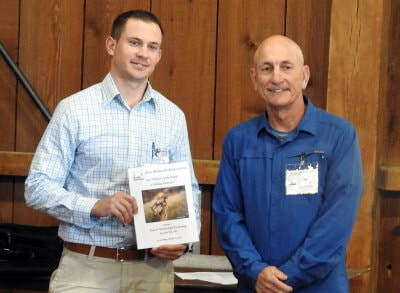 The award was accepted for NCRCPD by John Kiertscher, President, Envirotech Consulting, Inc., whose company has implemented the projects at the parks and has played an extremely large role in their success. Leader In Wetland Education – Edge of the Farm Conservation Area (EFCA) is a 32 acre restoration area that includes forest, prairies and five wetlands in Oxford. The area has been reclaimed from agricultural lands and wood lots into a dynamic ecosystem on the path to full recovery. The most impressive part of this restoration initiative has been the contributions of Miami University students in the Institute of Environmental Sciences. Over the years, hundreds of students have provided labor, transforming the landscape at EFCA and have received important hands on education about the environment and its revitalization. Dr. Hays Cummins, Professor, Geography and Western Program, and Dr. Donna McCollum, Professor, Institute of Environmental Services, both at Miami University accepted the award. OWA is proud to recognize the passion of these two professors and their students. Those students have greatly benefited from the knowledge they have gained and are using it to restore other ecosystems in Ohio and around the world. 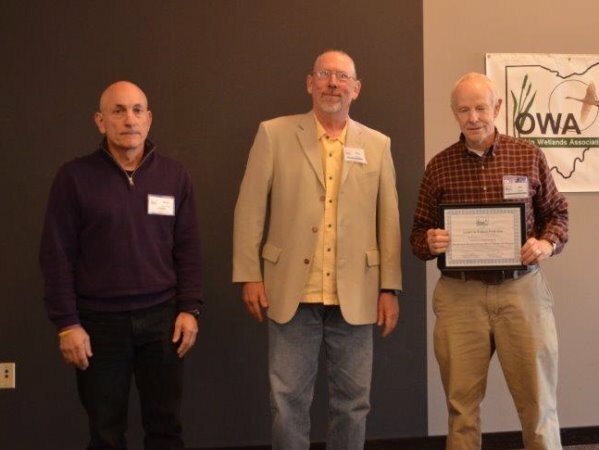 The Ohio Wetlands Association believes it is important to recognize those who have made exceptional contributions to the health of wetlands in Ohio. We are greatly appreciative of the individuals, groups and organizations that are making Ohio better through the wise use, education, protection, and restoration of our wetlands. 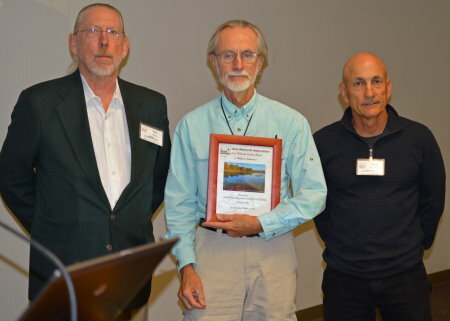 This year we recognized worthy examples of the outstanding wetland stewardship that has occurred in the state. The recipient will be an individual or organization that has been instrumental in developing and having adopted policies, rules, laws, ordinances, or other written instruments that will result in the informed Conservation of wetlands in an Ohio watershed or across the state. The Friends of Sawmill Wetlands has been a leader for educating the public about the importance of protecting the Sawmill Wetlands and other natural areas in their northwest Columbus community that has been plagued with over development. 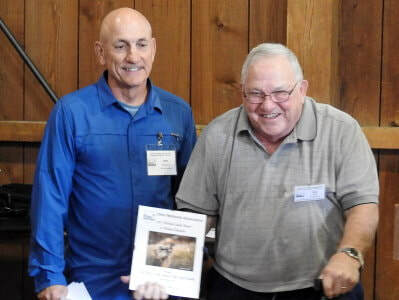 Along with their partner, ODOW, they sponsor educational programs each month that help area residents understand and appreciate what happens in the Sawmill Wetlands and why it is important to care for the remaining vernal pools left in Ohio. The recipient will be an individual or organization that has been pivotal in protecting an important Ohio wetland or wetlands that were under threat of imminent degradation or elimination. 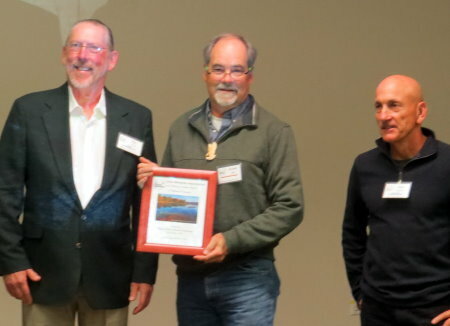 The Cleveland Museum of Natural History Natural Areas Program is selected for this award. This innovative program transformed an institution that housed historic specimens, fossils and dioramas into a living museum. They have acquired and protected some of the finest and most diverse natural habitats in northern Ohio and beyond. The recipient will be an individual or organization that has set the bar for achieving and maintaining high levels of natural ecological conditions in a restored Ohio wetland or wetlands. 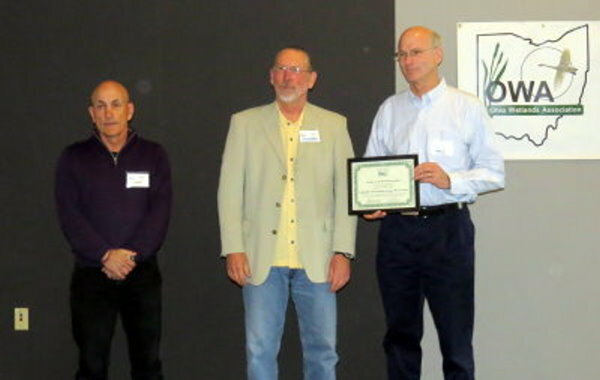 The Columbus and Franklin County Metro Parks is the recipient of this year’s award for wetland restoration. In the past two decades Metro Parks has restored hundreds of acres of wetlands at a wide range of locations across their park system. Wetlands restored include marshes, wet meadows, sedge meadows, vernal pools, and wet prairies. The recipient will be an individual or organization that has been exceptional in advancing the understanding of the roles wetlands play in healthy watersheds and moving wetland science forward in the State of Ohio. 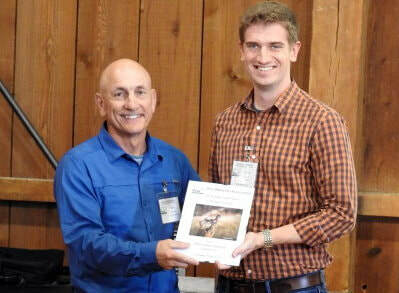 The Beaver Creek Wetlands Association is the recipient of this year’s wetlands education award. Their educational efforts have been multi-faceted. Over the past 25 years they have sought to preserve and restore wetlands. They have succeeded in creating a string of wetland pearls along the Beaver Creek, teaching the values and services these wetlands provide by using them as outdoor classrooms.